High quality, reliable and accessible utility and protective services are fundamental for successful industry. Edmonton’s industry has ready access to a range of urban-standard services from reliable power, water and waste management to reaching a city-wide labour pool through an efficient public transit system. EPCOR Utilities Inc. builds, owns and operates electrical transmission and distribution networks in Canada and the United States. EPCOR Utilities is a subsidiary of EPCOR, a municipally owned corporation headquartered in Edmonton, Alberta, and an Alberta Top 55 employer. Alberta has a competitive electricity market– providing industrial power consumers a choice of retailers for electricity products and services. Regulated distribution and transmission services are not dependent upon the retailer you choose. For a listing of licensed Alberta retailers, check out Alberta Utilities Consumer Advocate or call 310-4UCA (toll free in Alberta). Power is delivered through Alberta’s interconnected electric system. EPCOR owns and operates high voltage transmission lines and substations that form part of the Alberta system. These lines are situated primarily in Edmonton. Industry has the option to convert excess heat, steam or waste products such as methane or agricultural waste from their process into electricity. Surplus power can then be sold to the wholesale electricity market. Co-generation of power is increasingly being considered as a viable option for promoting eco-friendly development. Various public and private partners are pursing biomass projects in Edmonton and surrounding communities. These are designed to create a fuel or heating source from waste products or agricultural residues. Industrial or residential gas consumers can buy natural gas through regulated rates or arrange for a fixed-fee contract through a competitive retailer. Regulated rate providers' energy rates are based on expected gas prices for the month and any balances carried forward from prior months. Regulated rate providers are not allowed to make a profit on the cost of gas but may, with their regulator’s approval, recover other non-gas charges through their fees. The rate changes every month based on prevailing market prices. Competitive retailers offer fixed prices for terms of one to five years. Offers vary with prevailing market prices, but rates are fixed once you enter into a contract. 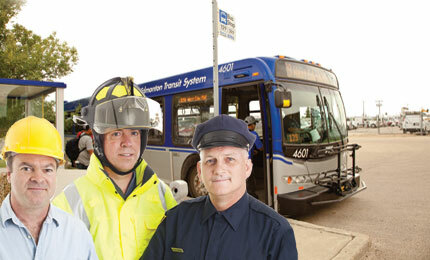 Edmonton Transit Service (ETS) operates a comprehensive city-wide bus and light rail transit (LRT) service providing cost-effective public transportation to most neighbourhoods and work sites. A major new LRT extension serving southwest Edmonton has been completed. A direct LRT/bus link to Edmonton International Airport is being pilot tested. This connects passengers from northeast Edmonton to southwest Edmonton through one easy connection. Major LRT expansion is underway to Edmonton’s north, southeast and west end. Edmonton’s neighbouring communities are served by various RCMP detachments that work with the EPS as needed. A hazardous materials team responds to substance release incidents including chemical spills, cargo tank truck rollovers and radiological and explosion events. EPCOR Utilities Inc. provides safe, reliable drinking water and wastewater treatment services to more than a million people in 65 communities in the Alberta Capital Region as well as providing electricity services. In addition, EPCOR supports industrial development outside the Capital Region. It supplies water and wastewater services to more than 6,000 workers at Northern Alberta oil sands camps and mining sites. EPCOR’s water and wastewater experts focus on analyzing total water management processes, considering ways to mitigate risks and maximize ongoing operational efficiency. This includes water reuse opportunities. Alberta’s supply of water is a precious resource for many different users. The Government of Alberta’s approach to sound water management is guided by the renewed “Water for Life” strategy. issues water licences to industrial operators for approval to remove water under the Alberta Water Act. the E.L. Smith plant, located 18 kilometres upstream. The water treatment process uses free chlorine, chloramines and UV light for disinfection. The two plants have a total capacity of 680 million litres per day. EPCOR’s Gold Bar wastewater treatment plant, the largest of its kind in Canada, is at the forefront of wastewater treatment technology through continual upgrades and innovations. EPCOR’s Gold Bar Wastewater Treatment Plant treats about 100,000 million litres annually – enough to fill 37,000 Olympic-length swimming pools. The facility produces effluent with a bacteria count 20 times below the regulatory standard. Current treatment capacity is 310 million litres per day. Treatment volume is about 100,000 million litres annually. EPCOR is a utilities company that services Edmonton.